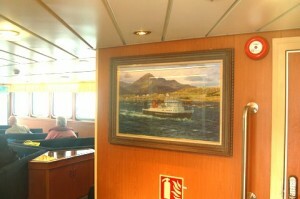 The Small Isles Ferry as the Inner Hebrides are called locally. 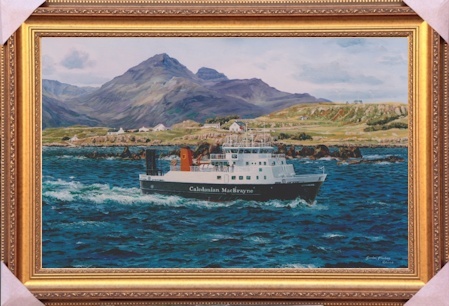 By Gordon Frickers, measures 61 x 91 cms (24″ x 36″), oils, commissioned by Caledonian MacBrayne Ltd, the original is onboard Loch Nevis. The painting was produced after a visit to the shipyard at Troon, Scotland and to the design office in Glasgow, in the artists Plymouth studio, delivered on time in budget. The third in a series of commissions which started with Clansman departing Castlebay, Barra produced for Caledonian MacBrayne, this splendidly atmospheric painting is displayed on-board the ship Loch Nevis in her saloon. 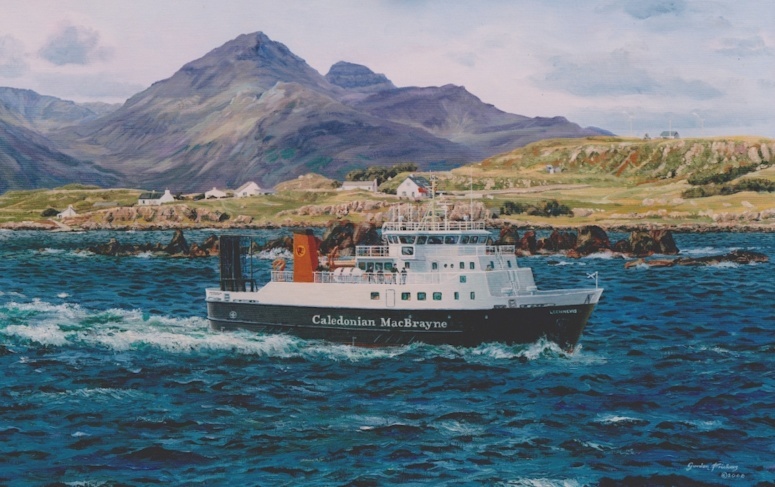 This beautiful painting, also available as a signed numbered ‘Heritage’print edition of 25 can be enjoyed by anyone lucky enough to sail on this delightful little ship Loch Nevis to make the great tour of the Small Isles (Inner Hebrides) off the west coast of Scotland. Gordon Frickers is honoured to be the only artist member of the British Marine Federation.